Located 80 m underground, in one of the most beautiful and biggest gallery of the Cave of Saint Marcel d’Ardèche, the Natural Wine Cave of the Ardeche Canyon was born in April 2015. All the winemakers working on the terroir of Saint Marcel d’Ardèche joined together with the local town hall of Saint Marcel d’Ardèche to create this unusual wine aging environment. Starting with 12 oak barrels of 300 liters filled with red organic Côtes du Rhône Villages, the winemakers quickly installed more than 1250 bottles of red and white wine to this limestone jewelry box. The first wine aged in barrels came back to the surface a year later and was bottled and baptized under the name: « Vinolithic ». Each year sees a new vintage coming to life. The wine aged in bottles remains underground for 2 years before being brought to the surface. It is then replaced by a new vintage. All of them carry the label « Aged in the cave of Saint Marcel d’Ardèche » as proof of their authenticity. Constant temperature of 14°C: all wine ages perfectly between 8°C and 18°C – no wine likes brisk changes in temperature – therefore this constant temperature is perfect ! Humidity level close to 90 % : cork and barrels, made in wood, will benefit from this humidity, that dilates and seals them, preventing oxidation. Absolute darkness : indispensable because wine doesn’t agree with light, in particular white wine. An advantageous environment : no odors, no micro-organisms, no bugs ; therefore fewer risks to contaminate the wine. These conditions allow each wine to evolve peacefully, revealing all the qualities reaped from the terroir of Saint Marcel d’Ardèche. 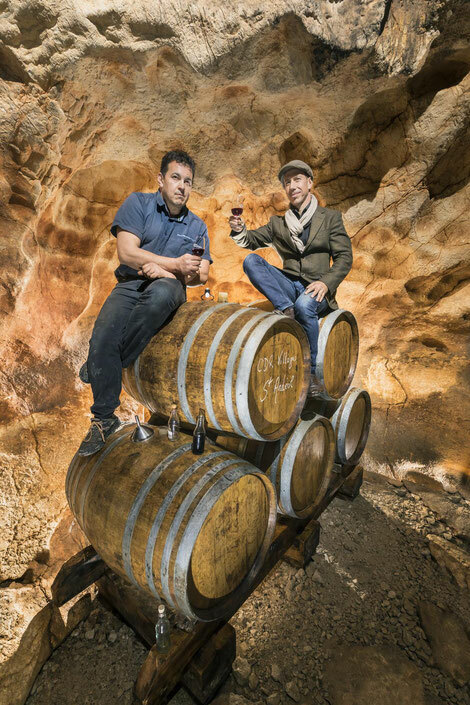 In the heart of the cave, each wine gains depth and minerality, for a greater testing pleasure ! An unexpected contribution to the wine : natural CO2. The wine is surrounded by this natural gas which is created along with stalactites as a result of the dissolution of carbonic rock by water.